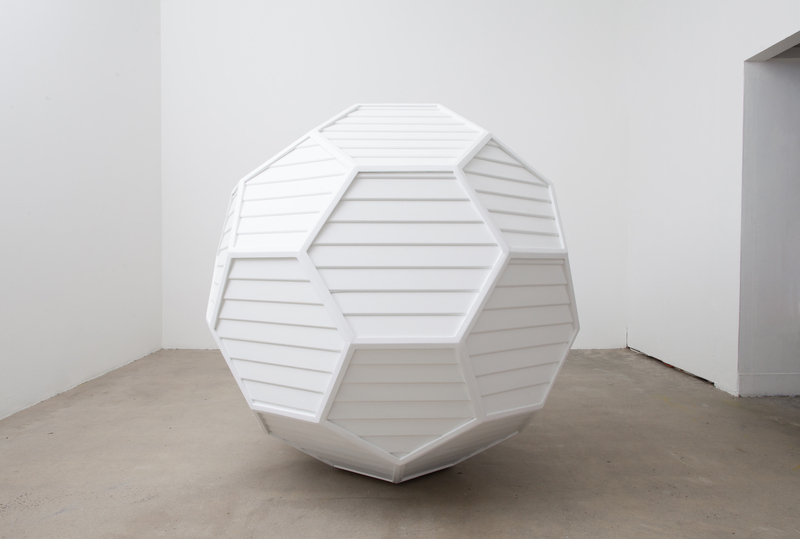 Maryrose Cobarrubias Mendoza’s 2012 sculpture house (Fullerene), is a hive-like structure made of white wood paneling that takes our associations of the “white cube” of an art gallery and humorously transmogrifies it into a loaded mixed metaphor combining Southern California’s pattern of immigration, local bungalow architecture, shipping containers, chemistry, and space travel. Yes, space travel, but we’ll get to that. 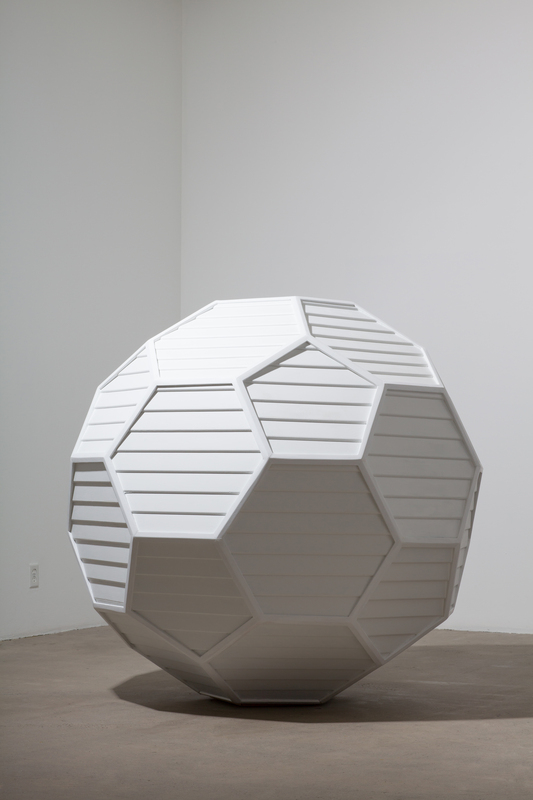 Maryrose Mendoza, house (Fullerene), 2012. Photo: Yongho Kim. The full title of this work by Mendoza, which was exhibited when she received a prestigious mid-career artist award in Los Angeles in 2012, refers to the complex carbon molecule that was named after the great architect and inventor Buckminster Fuller. As an engineer and visionary, Fuller imagined and built structures that at the time seemed to be works of science fiction. Called by some a neo-futurist, he was also an environmentalist and a technologist, a left-brain/right-brain magician who envisioned humanity on “Spaceship Earth” in the most sympathetic light. Fuller also wrote about sustainability in the face of what he predicted to be our possible extinction, suggested ways to eliminate poverty, and saw clearly what could become the blossoming of a new culture globally that used technology for good. Mendoza’s artwork draws inspiration from Fuller’s projection drawings and his structurally simple and incredibly strong geodesic domes. “I wanted to express an enclosure that embodies wholeness, peace and familiarity,” says Mendoza. But at only 195 inches in diameter house is, as she says, “‘tiny’ compared to contemporary American homes of today.” The humility of this gesture, a house fit for one, or a small nuclear family, is displayed in the way the work is scaled in proportion to the artist’s own body. But house is both a macro- and micro-dwelling. It zooms in and out, asking us to consider the extension of our bodies we think of as “clothing” and “architecture” with implications about what we perceive to be safe, cozy, and even necessary. 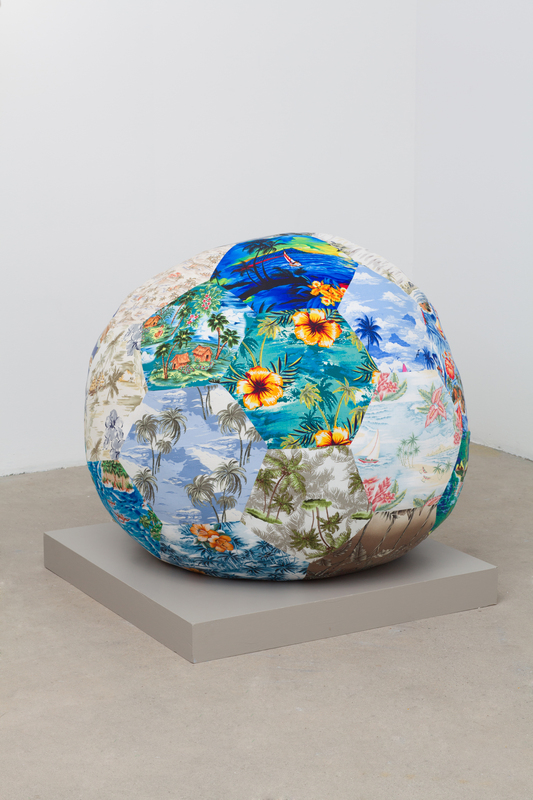 Another work, Global (2012), creates the same general structure, but out of 32 shirts with loud tropical prints. The piece is awkward, lumpy under its own weight at 135” in diameter, and has the appearance of an overstuffed bag of goods. But it also makes overt associations to tourism in island nations and, with some un-packing of its references, can shed light on Mendoza’s house. Maryrose Mendoza, Global, 2012. Photo: Yongho Kim. As a speculative structure, where is house to be built? One might say, nowhere. It has no openings, just as the shirts in Global, now stitched together, have no place for an actual body to go in and out. Both of the works seem to be meant as self-sufficient containers for a projected identity to inhabit. Buckminster Fuller’s idealistic geodesic domes were too, with geometry soon adopted to make into greenhouses or even symbiotic bio-domes; for example, with plants and fish living off one another’s waste products. The prints of ferns and large hyacinth blossoms in Global make humorous companions to house. Global delivers both the idea of a self-contained island and the remarkable diversity in our world that has been preserved by isolation. 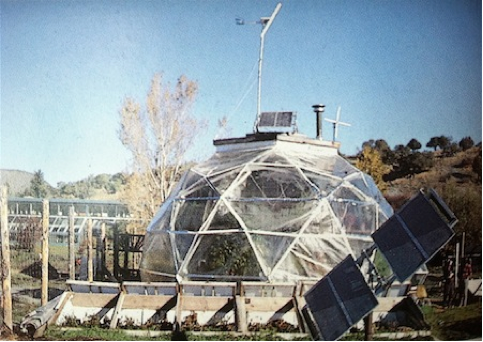 The last bio-dome designed by Buckminster Fuller, completed at the Windstar Foundation, Snowmass, Colorado, 1983. In a cultural sense, Mendoza’s own Filipino heritage seems to inform both works—in a more obvious visual way in Global than in house. However house, as a form that is completely sealed to the outside, suggests an interior analogical to the “self.” Not separable from the body, the self is nevertheless isolated in Mendoza’s sculptures from influences that may corrupt. There is a strong sense of maintaining identity. Inasmuch as colonialism and now global economic forces have put pressure on cultures to assimilate, they have also allowed colonized or occupied cultures to be “consumed” by the home countries as exotic ‘other’. Mendoza’s works can be seen as deflections of this circumstance. In house, where there could be windows, the faces are shuttered by the wood siding. In Global, the outward projection of an image of the islands in the print on the so-called “Aloha” shirts preserves the colonial fantasy; however, such clothing is an easy cloak for more authentic selves, who may want to don an image to present a certain appealing face and thereby preserve privacy. In these terms, Mendoza’s works suggest a performative element to identity and propose a hypothetical use-value for her structures, which expand outward to encompass larger themes of cultural preservation. 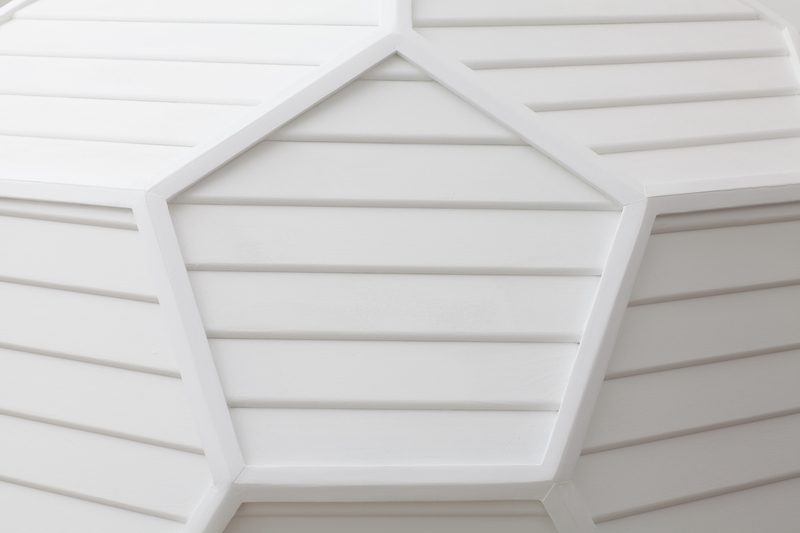 Mimicking beehives, the geodesic structures could be representations of self-contained eco-systems where the survival of the group, hive, or colony is dependent on harmony and balancing extremes between their two poles of hard and soft cladding. Just as bees leave the hive to find new flowers, return and communicate pollen-as-knowledge back through the system, the “worker bee” can also be associated with migratory labor that returns and enriches the home culture. The most successful export of the Philippines, in fact, is its people. What is interesting about this in reference to Mendoza’s work and her ethnic heritage is that Filipinos working in far-flung lands—from the United States, to England, to Austria, to Saudi Arabia—all participate in the uniquely Filipino tradition of a particular kind of personal importing. 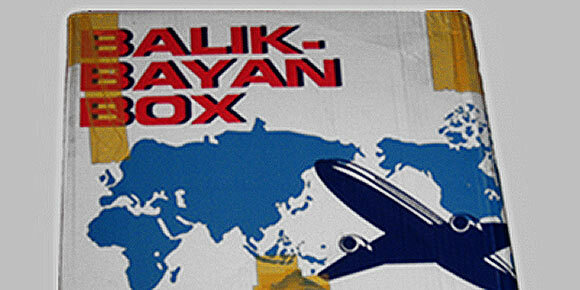 The way imported goods are transported to the Philippines is through the cultural phenomenon of the “Balikbayan box,” so named for the Balikbayans, Filipinos who work abroad and come home to distribute unique items only found in those locations. Each box can weigh up to fifty pounds and can be brought over to the Philippines two per person on Philippine Airlines, the national carrier. I have seen everything from toilet paper, T-shirts, house wares to chainsaws depart the United States in these boxes. There is also another minor version of the box that brings items from the Philippines out to the diaspora. House (Fullerene) appears to be a Balikbayan container, connecting one “island” or “I-land” to the rest of the world. The size limitations of Mendoza’s works suggest “essentials.” This paring down of life to its most basic, important elements is the dominant ideology impulsing modernism, whose simplicity is parroted in the “white cube” art environment to facilitate the movement of aesthetic wares we call art. But that’s just an inside joke when you see Mendoza’s work in an art gallery. The parenthetical title of the piece house (Fullerene) imputes yet another layer of complexity to Mendoza’s funny and charming sculptures. 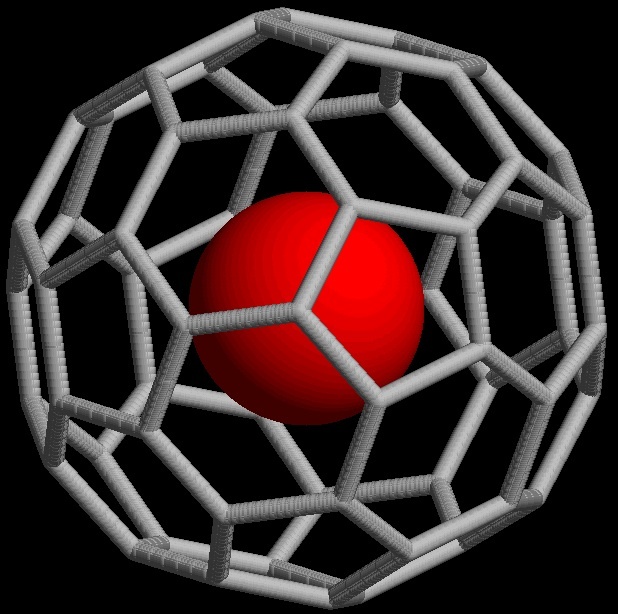 Fullerene is the name of a large molecule that forms a polyhedron of carbon atoms. It can be closed like a sphere or form long nanotubes. Fullerenes are stronger than their allotropic cousins, graphite and diamonds, and are thought to be plentiful in the universe. In fact, as long chain carbon molecules are progressively discovered in the intergalactic medium, they have now created a treasure-hunting atmosphere amongst astrophysicists studying the evolution of planets. In 2010, when astronomers using the Spitzer Space Telescope found fullerene (also known as C60) in space, they had identified the largest molecule yet to be found in space. Fullerenes are being touted as a futuristic material with technological capacities to build extremely strong armor, or form high tensile cables for space elevators. But they also have a very special capability as “clathrates,” molecules that can internally trap other smaller molecules and transport them from place to place. Importantly for Mendoza’s work, some astronomers see the carbon cages of fullerenes as lifeboats in space, possibly having provided “seeds for life on Earth,” according to astronomer Letizia Stanghellini of the National Optical Astronomy Observatory in Tucson, Arizona. Fullerenes could have been—and still be a way—for amino acids found in the galactic medium to colonize otherwise lifeless planets. As humans endeavor to travel further into space, house (Fullerene) takes cues from the safety requirements for interstellar travel, where completely hermetic capsules will be necessary to engineer to protect humans from damaging radiation and cosmic particles. House could even be thought of as a kind of cryochamber, a stage populated by those whose suspended desires are cradled post-departure and pre-arrival. Suggestive of shelter, community, cohabitation, and Buckminster Fuller’s vision of “Spaceship Earth,” Mendoza’s subtle sculptures meditate on space and place, ecosystems, and the catalyzing influence of immigrants. Thinking about traveling away from our native terrestrial home to search other planets, we must consider how we will bring samples back to Earth in our Balikbayan spaceships of the future. On the surface of Mendoza’s sculptures, which is all we can see but not imagine, play a myriad of familiar icons. The references in Global to beach culture with its stereotypical Hawaiian shirts, and the wooden siding from the classic California bungalow architecture in house both suggest California’s exponential population growth and ultimately bring the sculptures home. Nomadic editor Ellie Shoja contributed to the exchanges in this studio visit. All photographs of Mendoza’s work by Yongho Kim.